You will not be disappointed with this superb new book, which is probably the easiest and most user friendly book of its sort available! 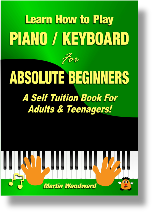 As the name suggests, this book has been written for the absolute beginner and assumes no prior musical knowledge - just the desire to do it! The contents are suitable for piano and / or electronic keyboard. Available as a (printable) eBook - instantly downloadable or as a coil bound paperback (monochrome only), conveniently designed to lay flat on your music rack. After completing this book you will have a good basic understanding of music theory as well as a good basic playing technique, paving the way for more advanced study in your chosen field - jazz, blues, pop, classical etc. Instant Download Version - only £4.99 IMPORTANT: After payment is complete click the BACK TO MERCHANT button where you will be redirected to where you can download the guide instantly!